When? August 2013. The BIG Trip. Coming from Fiji via Los Angeles. Next stop – Boston. It’s still the same day. I’ve gone backwards over the dateline to Los Angeles and actually arrive almost half a day before I set off. A six hour wait at LAX, which must be a strong contender for worst airport in the world and than a hop to Vancouver, arriving at eleven p.m. I’ve spent most of the time queuing, first to get into the USA and then to get out of it again. A very, very, long day. Shellshock. It’s freezing (well 12 degrees) and pouring with rain. Full of jet lag (I’ve lost 5 hours this time) and shivering, so I decide the best option is a trolley bus tour to refresh my memories of ‘the number 1 place in the world to live’. Except that the windows all steam up, so I can’t see out and it’s so cloudy that there isn’t much to see anyway. I’m told Vancouver has great mountain scenery and a fabulous harbour, but I will have to accept what I’m told. The driver says it’s the first day of fall and it always rains in the fall. If I recollect correctly it was like this last time I came, and that was in the spring. A quick foray into the mall to stock up on fleeces seems a good idea. I also buy an umbrella so that I can shield my camera from the downpour. Then I take a risk and get off the trolley in Stanley Park to take pictures of the totem poles. The umbrella idea doesn’t work; practical multi tasking is beyond me, as I can’t balance the brolly and depress the button at the same time. It’s tipping it down really hard and there is little shelter so I decide I had better walk up to the next stop. Cars driving past take great delight in sending up great waves of water as they speed along. I am drenched. Finally I flag down a trolley bus. Then it breaks down. And the people are so grumpy and rude. Is it the weather? I’ve been barged past repeatedly. If you give way or hold the door no-one says thank you. I even had a battle with the taxi driver yesterday who tried to cheat me. And when I try to chat to people on the bus they look at me as if I’m mad. The only good thing I have to report is that the leaves on the trees here are beginning to turn. That augurs well for the rest of the trip. And at least I leave tonight. The train is great fun so far. It’s fifties refurbished steel, typical diner style and is very long. They board economy on a different platform and then hook the cars on the front. 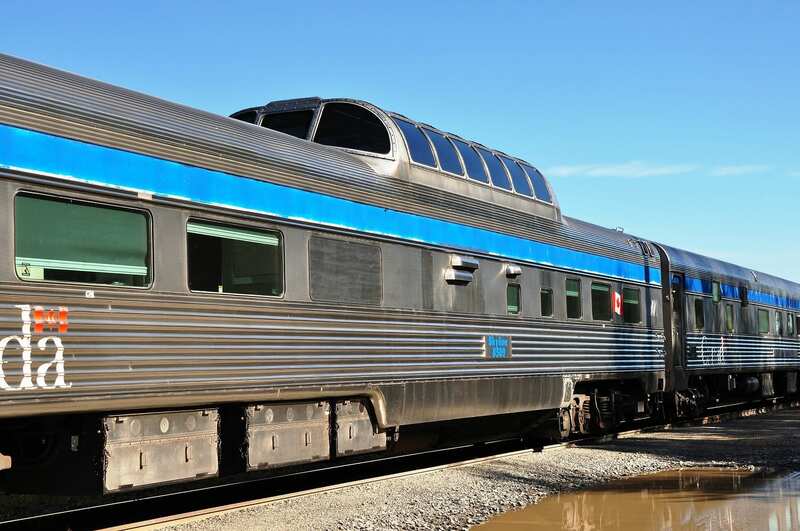 There are observation cars and a dining car as well as an activities car. I expect I shall avoid that. I have a dinky little cabin with my own washbasin, a toilet that doubles as a foot stool (a little bizarre) and a fold down bed. The other passengers seem to be tour groups, quite a few of them English. We travel at snail’s pace for the first part of the journey, leaving in the evening, when we are offered champagne and canapés to celebrate. The steward says that he had been instructed to give us one glass each. Then he winks and tells us that if our glass is empty that means he can give us one glass. And he hands me a tumbler anyway. 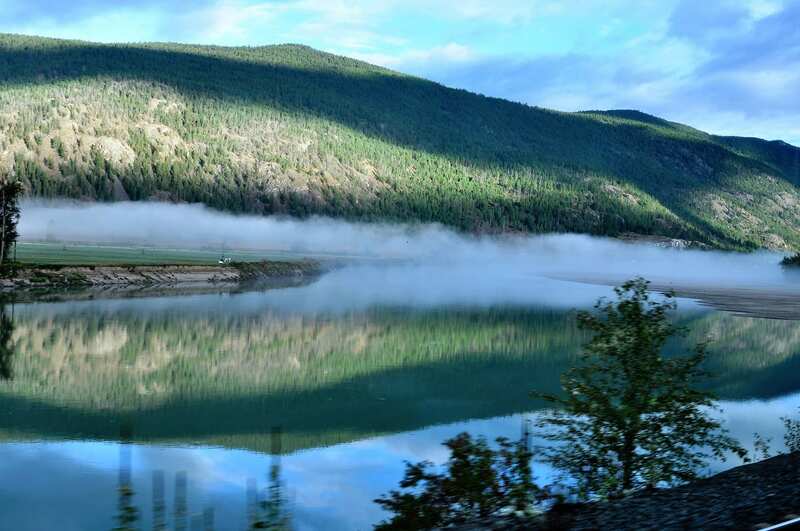 The train chugs past hills that gradually increase in height to mountains capped with the first snow of the winter, turquoise rivers and endless fir trees mingled with birch and aspen.These are turning a golden yellow and when the sun peeps out, as it does on occasion, the views are glorious. Unfortunately, there is still some rain as well. 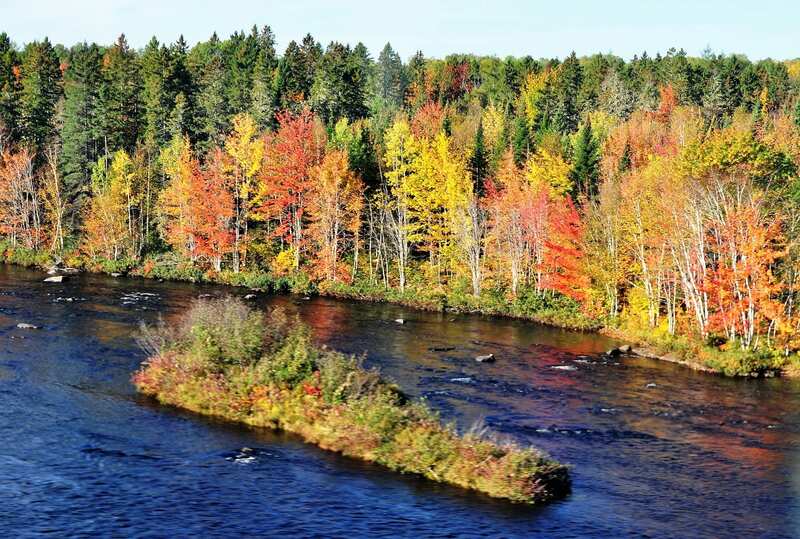 There are very few inhabitants, just the odd lumberjack at a saw mill or floating logs or a farmhand feeding the pigs and a sprinkle of log cabins. Using the camera is even more problematic than trying to photograph fish, with the rain and reflections. The train speeds up at all the wrong moments or a tree, another train or power lines appear just as I squeeze the trigger. I suspect most of the collection so far will have to be deleted. The food is flowing freely. It’s like being on a cruise. Other than the three main meals, in the dining car, there are drinks, pastries and fruit being handed out all day. In the afternoon it’s into Alberta, losing yet another hour and over the continental divide, stopping at Jasper. Five hundred and fifty miles so far. The last time I was in Jasper, decades ago, I walked down the high street with an elk. This time no elks in town- they have been discouraged, but two swimming in a river. Jasper is still a two street town, but it’s a good opportunity for me to get a little exercise and take some pictures that aren’t blurred. And it is just like a cruise as everyone piles off and hits this shops with adjunct ions to make sure that they are back on time, which doesn’t give us long, as the train is already running fifty minutes late. I have palled up with a lady called Hilary, who has the ‘roomette’ opposite mine. She departs with her tour group at Jasper, so I speak to the attendant, Dionne (who only attends to sleeping quietly in his own cabin as far as I can see) and establish that no-one will be occupying her space until tomorrow. So I requisition it as my ensuite. That means I can leave the bed down in my room and admire the scenery from under my warm duvet. 24 September Route 66 in reverse. I’ve slept through Edmonton at midnight and now we’re heading for Saskatchewan and then Manitoba and the loss of yet another hour. The pace is very variable. Sometimes we really crawl and we often have to stop entirely and wait for the two mile long freight trains to pass, as they apparently have precedence. We only speed up if there is a photo opportunity. In an unexpected burst of energy Dionne tells me that the train has been known to run as much as 18 hours behind. We have left the mountains behind, and for sometime I can see only forest in every direction. Then the landscape flattens into prairies and skyscraper silos, but it still holds the eye. To my surprise, I am too engrossed to read at all. The wheat fields are prettier than their American cousins, more undulating, interspersed with areas of wetland, rippling reed mace and waterfowl, dappled with sunshine. A stag is drinking at one lake. There is a smattering of chocolate roll hay bales – very David Hockney. And the trees are definitely looking more and more autumnal. There are also giant heaps of pink potash. Confusingly, the temperature has climbed up past 20 degrees in sunny Saskatchewan and my cabin has turned from fridge to oven. It’s great that the increasingly mellow foliage is magnificently illuminated. There are some stunning river valley views in Manitoba. It’s just a shame the train is going too fast to take any decent pictures. I leap off at Saskatoon (great name) but there is nothing there. A grubby little station, a few trees and a lot of railway sidings. Still, it’s sunny, if very fresh, and I loiter very close to the train. I’m terrified it will leave without me. I leap off again at Winnipeg, but it’s nine in the evening and everything is closed, except for a pub. Just time to pick up some WiFi and do my emails. Catching up with work is a good way to get stressed just before bedtime…. Life in a sardine can is becoming a little tiresome, especially as I am now deprived of my en suite. I can’t reach or find anything without scrabbling around and banging my head. I have to reverse back down the corridor every time I meet someone going the other way.The passengers, mostly grizzlies of American/Australian nationality in the main, are not super friendly. Neither is the service. One of the waitresses is called Sunny and she is not aptly named. Slip, Slap, Slop would be more appropriate. My fellow tourists seem to spend the majority of their time on board sleeping. I’ve ended up eating most of my meals with some Germans, so the conversation hasn’t exactly flowed. The food is a bit variable too, passable is probably the most accurate descriptor, though crab eggs Benedict could most politely be described as unusual. I’m also dealing with other issues: I banged my toe getting off the snorkelling boat in Fiji and one kind soul on the train trod on my foot yesterday so that’s throbbing a little. My nose is peeling very unattractively, another South Pacific legacy. As you will probably have deduced by now I’m grumpy; I haven’t been sleeping very well. The train is noisy, there are numerous untraceable rattles, and it bumps along; the track was so bad last night that I was convinced that a derailment was imminent. When I finally do regain some ability to decision make it is 7.45 and I think I had better go along to breakfast, before the hordes arrive. Then a cheery voice comes over the tannoy announcing that we have just lost another hour. Cripes, if I don’t get a move on I won’t get any breakfast at all. Everyone else has the same problem and there is chaos as we all arrive together and have to sign up and wait our turn. The scenery is still fascinating, however. Ontario is massive. It’s going to take nearly two days to traverse, and it’s been forests and lakes glittering in the sun all day. There are endless skinny spiked firs, but their sombre green is continually enlivened with the fiery orange and yellow of birch and aspen and the odd crimson carpet. Various activities are announced as we roll along. We even have musicians on board. They are very pleasant girls, I was chatting to them yesterday at dinner. But I refuse to take time out from the view. I even forgo lunch today. Though, to be honest, I’m still suffering from my late breakfast. And there are mountains of free fruit, not to mention cookies and croissants, in the park cars. Today’s stop is at Hornepayne, which appears to be a fifties ‘old’ station, with a few murals and, quel surprise ( have to practise the French again), little else. However, it does have a WiFi signal that works, so here’s another first. Writing emails in the sunshine on a railway siding. At least it’s not bedtime. Talking of French, it’s very reassuring listening to the English speaking Canadians attempting to make their announcements in French. Their accent is truly execrable and it’s peppered with ‘ooh la las’. I can’t decide if they are being deliberately subversive. More drama-at dinner I begin to itch and when I undress later, in the hopes of a good night’s sleep to end my journey I discover that my whole body is covered in red angry bites. Really odd as I’ve been fully clothed the whole trip. I summon my new cabin attendant, who luckily takes her job a little more seriously than Dionne and we strip the bed and examine it for wildlife. Nothing to be seen, but she replaces the whole lot. The only other possibility is the shower, which is at the end of the corridor. I shan’t be having another one of those till I get to my hotel. Meanwhile, here’s to an itchy night. I had thought the Canadians were trying to make up for other shortcomings by personalising the phone service, but it seems that Rogers is the local equivalent of Vodafone. I’m in Toronto, drinking what is billed as the best apple martini in the world. It probably is too. The steak is pretty wonderful as well! Ah civilisation!!!!!! My agent must have got a good deal on this hotel. Think The Ritz with chandeliers and its own little arcade of shops. I woke up to a completely different world. Little homesteads, clapboard houses and crimson trees. I’ve done very well. The weather is unseasonably gorgeous, I seem to be dragging a warm front along with me and fall is at its peak. I’m not sorry to leave the train. I had the service manager taking photos of my bites and an itchy night. When I finally got off the train the ground was still swaying and I thought for a moment I was in a time slip. London, Kingston and Brentford were all on the departure board. I’m still itching. And my face is still red; my nose has begun to peel again. However, it’s still glorious weather and I’m about to catch the train again, to Montreal. I’m not sure my body realises it’s left the train yet. I’m sure we pulled out of a station as I got out of bed this morning.Today’s journey is initially a mixture of suburbia and views across Lake Ontario, then farmland and woods as we follow the St Lawrence river. To begin with Montreal is a little daunting. The French announcements take precedence over the English ones the second we enter Quebec; all the signs and billboards are in French. However, on short acquaintance Montreal promises much more than Toronto. It has atmosphere, a proper old town and port (as in eighteenth century), which has character, cobbled streets full of cafes, bars and those expensive boutiques that have wood floors and one rack of clothes. You would have to say it was both hip and happening. I stroll along the waterfront taking pictures of the museums and bridge in the sunset . The trees are just the sort of bright autumn red that you only see in photographs. I can prove it. And best of all, the inhabitants move smoothly from French to English without batting an eyelid, let alone tutting at your effrontery in using English or your poor French grammar. Perfecte. A side trip to Quebec City today, as folk I meet keep telling me it is the most interesting city in Canada. It takes me three hours each way on the train, but it is easily worth it. Anyway the trains here are decidedly superior to what we get back home. Well designed, comfy, lots of space and free WiFi . (All of a sudden I have free WiFi coming out of my ears- O for some of this earlier on). I feel as if I’ve been teleported to another continent. The station is a little green roofed palace with turrets and I climb up a very steep hill (lots of exercise today as I’ve given up on tour buses and bought a map instead) to a seventeenth century (positively ancient in North America) walled town perched up above the St Lawrence (now a seaway). The views are stunning in all directions. The water is wide, blue and full of boats framed by the autumn foliage. The town itself is high end quaint (rather than hip), neatly colourful and full of jolly buskers catering to the tourist groups milling in the narrow streets. 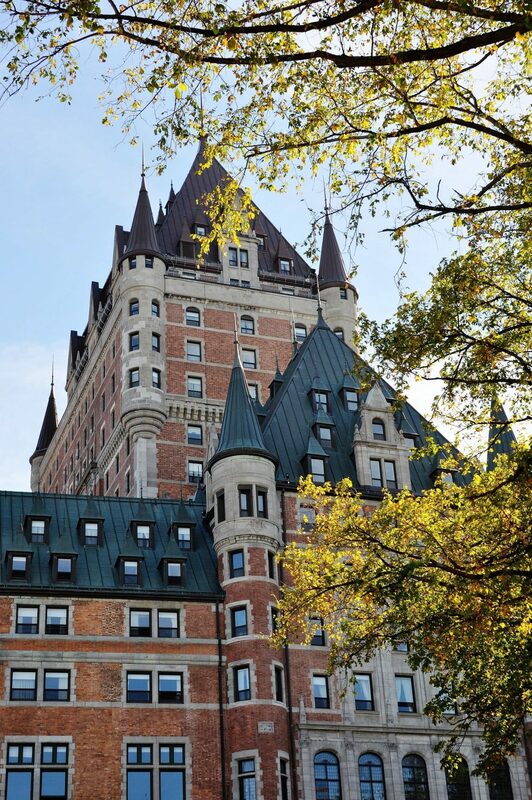 The legendary Chateau Frontenac towers over it all. It’s apparently the most photographed hotel in the world. It’s also a sister to The Royal York in Toronto. I wonder if my agent could have got a deal on this one? Even the vistas out of the train window are picture perfect. If you painted a watercolour you would have to use 5/7 of a rainbow. The first four colours for the trees and the blue for the sky. Still not a cloud in sight- left them all in Vancouver. Brilliant. A walking tour of Montreal today. 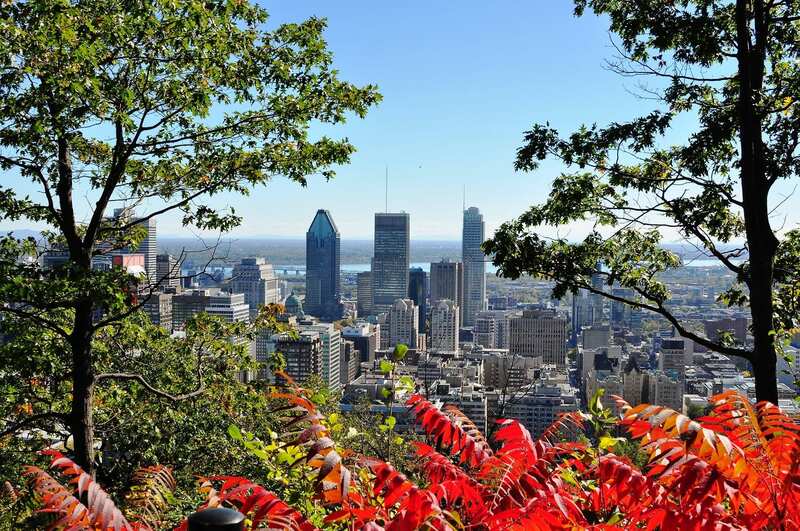 Up 400 steps to the Mount Royal Park lookout in search of fall colour. (The penny has just dropped- it’s not Mon- tree-all it’s Mont Real.) I discover plenty of colour. The trees here are like a tequila sunrise, yellow at the bottom, turning to flame orange in the middle and vermilion on top. And still a perfect blue sky backdrop. I also find a festival preceding a football game, complete with cheerleaders and whooping. More great views across the town and river. Scrambling down a gravel side path, in an attempt to avoid all the joggers, I am pelted by acorns. It’s not windy- is it the squirrels? Anyway, they hurt, a lot. I’m really glad I’ve never been hit by a coconut. Then all through downtown, it’s just like walking down Oxford Street, Chinatown (nice dragon gates) and back to the old port and town. A fire engine goes past, lights flashing. (They don’t pin pon here, they wail ). The town is thronging with locals enjoying the sun and again, there is lively music and street performers on every corner. The local delicacy on offer is poutine (fries with melted cheese and gravy), I think I’ll pass on that one. I’m exhausted. It will be good to rest on a train again all day tomorrow after all this climbing. Montreal or Quebec? It’s rather like choosing between Savannah and Charlestown. Savannah’s cuter, but I’d rather live in Charlestown. I’m on the way to Halifax, and this train is called The Ocean. It’s newer than the last one – they say that it was British, originally constructed for the Channel Tunnel and then deemed not to be suitable. They are very big on safety too. We get briefings about emergency exits and how to break the glass- perhaps its because of all the recent train crashes. This time I have a double cabin to myself, so it does have an en suite. Into New Brunswick, losing yet another hour and out into the gulf of St Lawrence. The hills across the water are so red they are glowing. Whole villages of clapboard now and little white churches with steeples. Incredible intense colour. The fallfest has already exceeded my expectations. Anything else will be a bonus. However, my photographic equipment has started to play up badly again – please last another five days camera! Chugging, finally into Nova Scotia. The French literally translates as New Scotland, but to start it looks more like Holland, very flat, very green, with those tall modern windmills. This terrain alternates with the rolling downs of Sussex. The houses are more grey, blue and green pastels. First impressions – Halifax is very quiet. No taxis at the station- I have to get the nice man in the hotel next door to call me one. My luck finally gave out .It’s raining. It’s the only rainy day forecast this week and the only day I have in Halifax. The town round the docks looks just like home. Grey, wet, red brick Victorian blocks, lots of pubs. (More per capita than anywhere else in America.) It’s one of the contenders for first or second biggest natural harbour in the world. Apparently Sydney, Poole, Cork and Falmouth are all in the running, but no-one seems quite sure who the winner is. Halifax very modestly bill themselves as second. (Sydney used to be the uncontested victor but has reclaimed too much land.) Anyway, (pause for breath) I can just about see it out of my window, through the murk. My hotel is nine steep blocks up from the harbour, which is all boardwalk. The room is described as ‘beachfront’. It’s pouring too hard to do any real exploring. I had planned to go down the coast and look for lighthouses. A short trip to the waterfront instead, especially as my back is not good. I don’t know if it was the bed on the trains or the bag carrying, but it’s been aggravating all week. Today I can hardly get out of bed. It’s very end of season down on the wharf. Half the little gaily painted booths are shut and all the tall ships are standing idle. There are a few brave tourists off a cruise ship and I can just about make out the lighthouse on an island across the water. ( A motu it is not.) There is still a little excitement as there are not one but two soggy marches going on in town. To my delight there are drums, announcing a stream of native Americans, complete with feathered war bonnets, followed by a troop of Mounties in ceremonial dress. 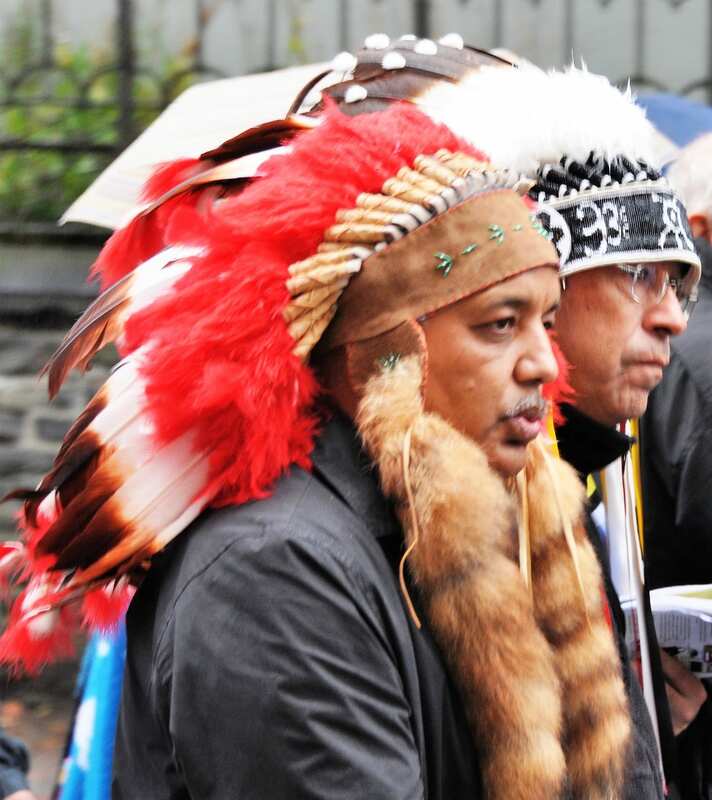 It’s the annual celebration of the signing of the treaty (1725) between the British and the Mi’kmaw people. Vying for space in the little square, and seemingly unaware that they have competition, are the feather boa wearing dancers of a breast cancer awareness group. There are also numerous bijoux eateries , predictably touting seafood. Lobster calls…after the chiropractor. 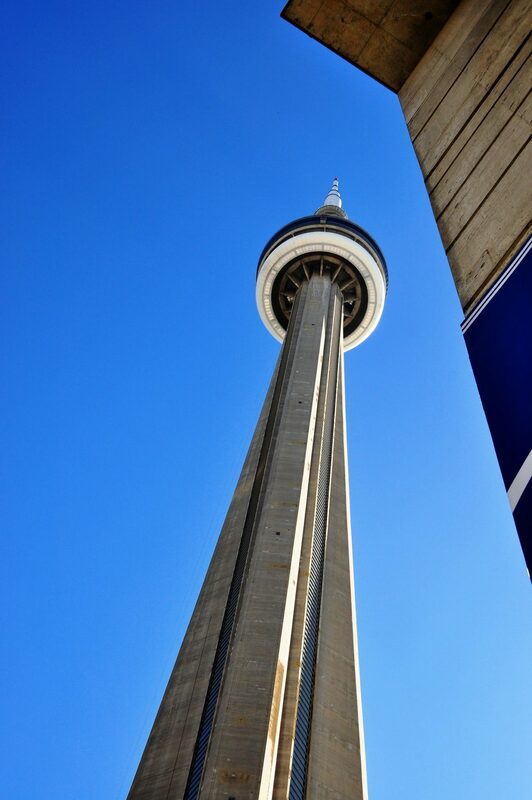 To see more of my photos of Canada, visit this page. When Jaques Cartier, a French explorer, came to the new world, he met with locals, who invited them to their ‘kanata’ (the word for ‘village’). Cartier mistakenly thought the name of the country was “Kanata” or Canada. This is the world’s most educated country, over half its residents have college degrees.